Geospatial mapping is an increasingly hot topic in large-scale natural disasters, including Hurricane Sandy and the Oklahoma Tornadoes. As technology continues to advance, data mapping is moving from being a powerful tool for specific cases to being a new norm in all disaster relief. Collecting and distributing critical information graphically helps both the responders and the millions of victims each year. 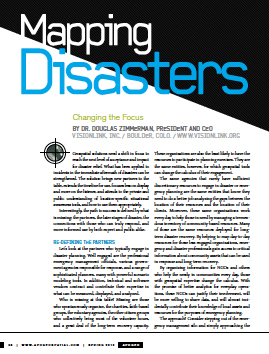 VisionLink President & CEO Dr. Douglas Zimmerman discusses these important shifts in disaster mapping and partnership-building in the Mapping Disasters article of Apogeo Spatial Magazine. Zimmerman argues that integrating the work of on-the-ground agencies, delivering information to the right responders, and extending map data from immediate to long-term recovery will bring geospatial solutions even greater impact as a standard tool in disaster relief. Read the full Mapping Disasters to learn more!